OBJECTIVE: To understand the general trends in atomic properties in the periodic table. The most fundamental classification of the chemical elements is into metals and nonmetals. Metals typically have the following physical properties: a lustrous appearance, the ability to change shape without breaking (they can be pulled into a wire or pounded into a thin sheet), and excellent conductivity of heat and electricity. Nonmetals typically do not have these physical properties, although there are some exceptions. (For example, solid iodine is lustrous; the graphite form of carbon is an excellent conductor of electricity; and the diamond form of carbon is an excellent conductor of heat.) However, it is the chemical differences between metals and nonmetals that interest us the most: metals tend to lose electrons to form positive ions, and non- metals tend to gain electrons to form negative ions. When a metal and a nonmetal react, a transfer of one or more electrons from the metal to the nonmetal often occurs. Most of the elements are classified as metals, as is shown in Figure 11.35. Note that the metals are found on the left side and at the center of the periodic table. 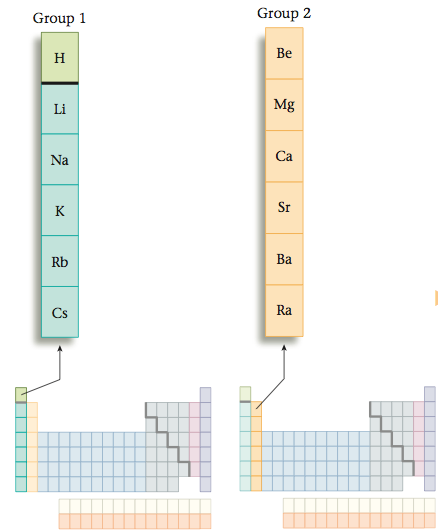 The relatively few nonmetals are in the upper-right corner of the table. A few elements exhibit both metallic and nonmetallic behavior; they are classified as metalloids or semimetals. Note that as we go down the group, the metals become more likely to lose an electron. This makes sense because as we go down the group, the electron being removed resides, on average, farther and farther from the nucleus. That is, the 6s electron lost from Cs is much farther from the attractive positive nucleus—and so is easier to remove—than the 2s electron that must be removed from a lithium atom. The same trend is also seen in the Group 2 metals (alkaline earth metals): the farther down in the group the metal resides, the more likely it is to lose an electron. As we have noted, the most characteristic chemical property of a metal atom is losing elec- trons to nonmetals. Another way of saying this is to say that metals have relatively low ionization energies—a relatively small amount of energy is needed to remove an electron from a typical metal. Recall that metals at the bottom of a group lose electrons more easily than those at the top. 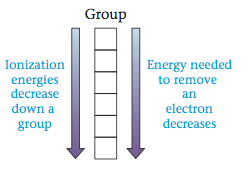 In other words, ionization energies tend to decrease in going from the top to the bottom of a group. In contrast to metals, nonmetals have relatively large ionization energies. Nonmetals tend to gain, not lose, electrons. Recall that metals appear on the left side of the periodic table and nonmetals appear on the right. 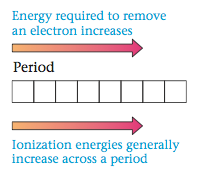 Thus it is not surprising that ionization energies tend to increase from left to right across a given period on the periodic table. In general, the elements that appear in the lower-left region of the periodic table have the lowest ionization energies (and are therefore the most chemically active metals). On the other hand, the elements with the highest ionization energies (the most chemically active nonmetals) occur in the upper-right region of the periodic table. The sizes of atoms vary as shown in Figure 11.36. Notice that atoms get larger as we go down a group on the periodic table and that they get smaller as we go from left to right across a period. We can understand the increase in size that we observe as we go down a group by remembering that as the principal energy level increases, the average distance of the electrons from the nucleus also increases. So atoms get bigger as electrons are added to larger principal energy levels. 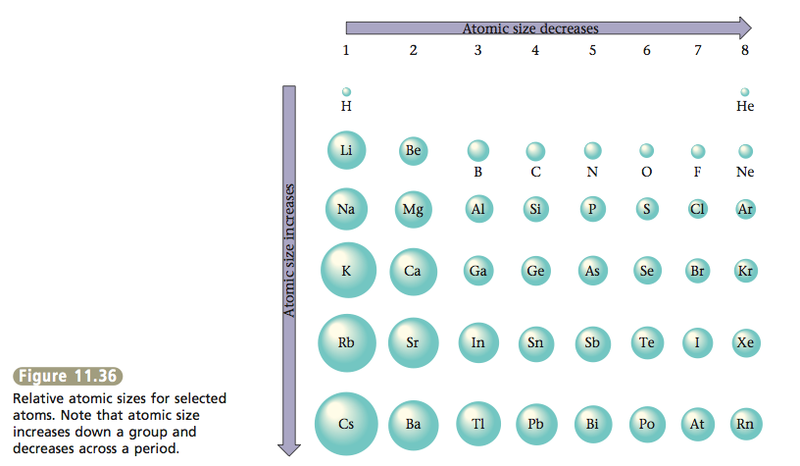 Explaining the decrease in atomic size across a period requires a little thought about the atoms in a given row (period) of the periodic table. Recall that the atoms in a particular period all have their outermost electrons in a given principal energy level. That is, the atoms in Period 1 have their outer electrons in the 1s orbital (principal energy level 1), the atoms in Period 2 have their outermost electrons in principal energy level 2 (2s and 2p orbitals), and so on (see Figure 11.31). Because all the orbitals in a given principal energy level are expected to be the same size, we might expect the atoms in a given period to be the same size. However, remember that the number of protons in the nucleus increases as we move from atom to atom in the period. The resulting increase in positive charge on the nucleus tends to pull the electrons closer to the nucleus. So instead of remaining the same size across a period as electrons are added in a given principal energy level, the atoms get smaller as the electron “cloud” is drawn in by the increasing nuclear charge.